R.J. Rushdoony: 00:00 We’ll continue now with intent, dealing more specifically with changing intent. I called attention earlier to the fact that in the modern era, wars have become revolutions, and historians have given too little attention to this fact. In modern warfare, the loser usually faces a revolution at home, and the winners, a nonviolent revolution also. Dramatic changes in their society. The wars that Great Britain has waged in the past two centuries have altered that country tremendously, and World Wars I and II have revolutionized the United States, because wars shatter the normal life of a country. They weaken morality and authority. A state at war with another state must organize its total resources for war, and wars thus mean inflation, and inflation weakens the middle class. A war economy replaces the consumer economy and the stability of society is altered by the social upheavals of war. And this is what has happened in this century. A succession of wars have created revolutions even among the winners. R.J. Rushdoony: 01:50 Moreover, Otto Scott, one of our staff members at [inaudible 00:01:55] has called attention to a very important aspect of war is revolution. He points out that it weakens the power of the old aristocracy because new leaders and new forces emerge. Now by aristocracy, we do not mean the European model, but more of the Jeffersonian model, which we have had here. An aristocracy of achievement, and of talent. Sometimes it could be that the old aristocracy has needed replacing, but what usually happens is that a new group emerges which wants power rather than responsibility, and so the result is trouble. R.J. Rushdoony: 02:55 In the United States, the old Puritan leadership was destroyed by the War of Independence. They suffered the most from it. They were the ones who did the major part of the fighting and they paid for it. Then the federalists were, to a very limited degree, a rallying point for some of the remnants of the old order, and not a very good representative of it. But they soon gave way to the Jeffersonians, and the Jeffersonians to the Jacksonians. And under Jackson, major steps were taken towards the de-Christianizing of the United States. The state took over health, education and welfare. And since then, the growth has been progressive in the power of the state. R.J. Rushdoony: 03:52 The same thing of course happened in the south when the old aristocracy was destroyed by the Civil War. In fact, it was a foregone conclusion before the war had been more than a few weeks old that the old aristocracy had been found wanting. For example, in Georgia, when the draft law was passed, it exempted the officers of the state militias. This was to preserve the state militias as a force. Well, the governor of Georgia, to take one state, immediately commissioned 10,000 Sons of the Aristocracy as second lieutenants. So while some of the planters’ sons did march off to war and fought heroically, most of them stayed home as second lieutenants. Now you can understand why after the war, the former confederate states couldn’t wait to turn on their old aristocracy and leaders. They hated them. War destroys the old leadership, and very often the old leadership deserves destroying, but the new leadership is not capable, and as a result, problems ensue. R.J. Rushdoony: 05:23 I called attention to the problem as John Adams saw it. He and George Washington were aware of it, and both in their lifetime were subject to the most evil and vicious attacks imaginable. In fact, some of those attacks on Washington are being resurrected again by people who are out to destroy the image of Washington. A book was published a few years ago about how Washington padded all his expense accounts. He would charge $1,000 for stabling his horse at an inn overnight, and so on. All the data was true, but what the author didn’t say, it was with worthless continental dollars, so $1,000 was nothing. It was worth very little. But that book now is accepted everywhere and it’s data routinely quoted. R.J. Rushdoony: 06:30 We have a war continuously against Christian civilization, which is being stepped up. The churches are not been a help. The churches, Arminianism, Unitarianism, antinomianism, and then modernism have captured the churches, and they have transferred authority from God to man, and infallibility to the spirit of the age. Octavius Brooks Frothingham, in one of the most influential books of the last century published first in 1873, wrote, and I quote, “The interior spirit of any age is the spirit of God. No faith can be living that has that spirit against it. No church can be strong except in that alliance. The life of the time appoints the creed of the time and modifies the establishment of the time.” Unquote. R.J. Rushdoony: 07:36 It’s out of Frothingham that you get the temper that in the sixties and seventies led to saying, “You’ve got to be with it. You’ve got to be in tune with your time, because that’s the truth of the age.” And so he held that it was not a word from heaven, nor even a word from man’s history which had authority. It was the spirit of the age. Moreover, each era, Frothingham held, has a new truth and a new creed. And finally that every faith and every church, which is not in tune with the spirit of the age cannot prevail. As a result, we must discard yesterday’s beliefs and yesterday’s laws for today’s. R.J. Rushdoony: 08:36 Now, this kind of thinking which came out of Hegel in Germany, and which Frothingham and Emerson, whose close friend he was, popularized, has become a part of our life today. Thus in one public school textbook after another that deals with values and value education, each person, we are told, each child is to develop his own values out of his own thinking, and out of his own tastes, and in terms of the spirit of the age. R.J. Rushdoony: 09:22 Well, this has been applied not only to the Bible which is reinterpreted to mean what men today want it to mean, but also to the Constitution, and so it is regularly reinterpreted with a spirit of the age. Law today means what people today want it to mean. Earlier in the last century, some of the man who departed from a Christian perspective said, “The law is logic,” and therefore they emphasized reason above revelation. This was a project again of Hegel and his doctrine that the rational is the real. But very quickly, this eroded to the position of Oliver Wendell Holmes and his famous book, The Common Law in 1881. The law, he said, is experience. The law simply codifies the experience of people, social experience, so that the law thus is to enthrone social experience and sociology. Remember earlier I said that the Supreme Court turns to sociologists to render decisions? Now whether we like those decisions or not, the premise on which they do it is wrong in that it enthrones something other than truth, and we need to grow in terms of the truth, not collective experience, because collective experience, the will of the people meant one thing under hate, under Hitler, another thing under Stalin, and another thing under [inaudible 00:11:33]. R.J. Rushdoony: 11:36 As a result, we have had the so-called equalitarian consensual values enthroned as the American creed. Legal humanism, as a result, has prevailed. All legal documents are now increasingly open to interpretations which frustrate their plain meaning. I mentioned wills earlier. We are beginning to see an erosion even there, so that a man who makes a will has no assurance that it will accomplish what he purposes. In every area of life, the meaning of words has been eroded because of the current legal philosophy. The root cause, however, is this. Where God’s word is depreciated, man’s word very soon means nothing. Changing intent, thus, has very far reaching implications. R.J. Rushdoony: 12:54 Let’s consider briefly article six, paragraph two, concerning treaties, which now has meanings once unimagined. I quote from that. “This Constitution and the laws of the United States, which shall be made in pursuance thereof, and all treaties made or which shall be made under the authority of the United States shall be the supreme law of the land, and the judges in every state shall be bound thereby anything in the Constitution or laws of any state, to the contrary notwithstanding.” Unquote. Now, that provision was written because the various colonies were used to being independent crown realms with treaty making powers in certain spheres, and to prevent the various states of the United States from continuing to act as independent countries, this was necessary, but it did make treaties are the supreme law of the land. R.J. Rushdoony: 15:54 Now, what Roosevelt and Churchill did at Yalta was to make, as the Supreme law of the land in the United States, the use of prisoners as slaves. I mean, slavery is legalized on an international basis. Have you ever wondered why Washington DC is silent about the men missing in action in Vietnam? Is it related to this under the fact that we have legalized slavery for prisoners of war? And we’ve given a very loose interpretation to it. Do you know that just recently to pay for all the Soviet troops in Mozambique, 18,000 Mozambican children ages 12 to 18 were shipped to the eastern block to be used as slave labor? And there are Vietnamese children and young people paying off the war cost who will never see Vietnam. R.J. Rushdoony: 17:20 We have legalized slavery on an international level, and we must remember that the amendments to the Constitution 13 through 15 prohibited the private ownership of slaves, not federal ownership, so slavery on and international level by civil governments has been legalized. Such slavery can now be introduced by due process of law, and I’m quoting, “As a punishment for crime whereof the party shall have been duly convicted.” Unquote. We are in trouble. R.J. Rushdoony: 18:22 Moreover, at the same time, the doctrine of justice has been eroded by humanism and law. From God’s justice as revealed in his law, men have turned first to natural law, laws inherent in nature, but because nature has fallen, such a doctrine is a false one. Moreover, Kant undermined the natural law doctrine and replaced it with human logic, and then Darwin also further undermined it. So now we are in trouble. At the beginning of the century, law was seen as comparable to the truths of Newtonian physics, but Newtonian physics has now been exploding. And so law today is what reason and experience tell us. Whose reason and experience? That of the elite. The concept is that of philosopher kings, after Plato’s [inaudible 00:19:34]. And so today the democratic consensus is not what the majority believes. It’s what the elite leaders tell us the majority would believe if they had any common sense. R.J. Rushdoony: 19:53 Today, a concept of law, whether it is here or in Marxist countries such as the Soviet Union is not very different. It depends on an elite group. Roscoe Pound, one of the greatest of the humanist legal scholars noted, but he didn’t understand the reason for it, that law is disappearing, and I quote, “because it is superseded by an only competent administration,” unquote. In other words, bureaucracies are replacing the courts because law is eroding and controls are increasing. R.J. Rushdoony: 22:54 The significant thing was, and this was not the first time by any means, I was not in a court of law, but in a bureaucratic court. I have been in civil courts where are the attorney general has been opposed to the case, but another attorney general, unelected, coming from the Department of Education handled the case. Courts of law are disappearing because, in the place of law, which means something that is right or wrong, you are replaced with sociology and psychology. But why should we be surprised at this, when the most popular kind of book with ministers is a pastoral psychology book, not the Bible? Tells us something of the problem. The intent of the law thus is not important to those who deny God’s law. Change and chance then replace God as the governing force in the universe and justice then has less and less meaning, and the control of change and chance becomes a central concern of a bureaucracy. We are more and more governed by bureaucracies. Less and less by Congress or the Constitution. This is the logic of our present time. R.J. Rushdoony: 24:58 I have about 10 minutes? All right. We can take a few questions then. Yes. Speaker 2: 25:07 [inaudible 00:25:07] pointed out that year after year [inaudible 00:25:20]. R.J. Rushdoony: 25:45 The secularist movement did begin at that time. It was one of the effects of the war. John Jay himself was a very devout Puritan. Madison had the training and was very familiar with the Bible. Hamilton became more and more Christian as time went on. The Federalist Papers do not quote the Bible much because they were aimed at a particular audience. They were farmers for whom they were written. Today graduate students have problems reading them, which tells us what has happened to the level of learning in this country. They were directed at a non-Puritan group. Speaker 3: 26:47 [inaudible 00:26:54], and if so, was it collective [inaudible 00:27:09], or something that was individual [inaudible 00:27:12]? R.J. Rushdoony: 27:15 The framers never dreamed of or imagined a huge state such as we have now. One of the things it is revealing, that until Lincoln, the term the United States took a plural verb. “The United States are.” After 1860, “The United States is,” gradually came into use. In other words, they saw it as essentially a collection of self-governing states who are to unite in terms of having common boundaries and to be allied in case of any war. So the United States had a very limited function, and this is why Congress met briefly, as did the courts. At the same time, even the state governments had a limited function, because they did not see government or imagine it as being civil government, the state. R.J. Rushdoony: 28:22 Up until just a few years ago, for example, in Indiana, the state capitol had the offices for the legislature and the apartment for the governor to live in, and it was the home away from home for the people involved. And it only met once every couple of years for about two weeks. This was true in state after state. I can recall being at one state legislature where I spoke to the assembled senators and assemblymen, and they had recently passed a measure calling for annual meetings on the speaker of the house. And the old timer said, “This is a disaster.” He said, “The bureaucracy will grow. It will be able to nag every one of us every day of the year for more money and more power and they will get it, and it will be the end of the freedom of the people in this state.” And he was right. R.J. Rushdoony: 29:43 Now, that was only in the late sixties, so they’d never imagine the kind of country we have now. They did imagine its size. In fact, one of our forgotten founding fathers, Patrick Henry, whom the generation in school now knows nothing about, his name is dropped out of most books, was Governor of Virginia near the end of the war, and he got together an army of Virginia, and under Colonel Rogers sent it into the Midwest with a command. “Clean the British out of the Midwest. We cannot afford to have the peace treaty signed before we have taken that over,” and he had a good reason. If the British owned everything over the mountains, the United States would be perpetually a few colonies or states on the Atlantic seaboard, but if they cleaned the British shot, then everything would be open to the Pacific Ocean. And the battle of Vincennes is by some Europeans, is listed as one of the most important battles in all history, because it was there that the Virginians made the United States a great nation instead of a handful of states on the Atlantic seaboard. R.J. Rushdoony: 31:20 Now, they did imagine its size. They did imagine its potential. They dreamed about it, but they never imagined that people would surrender their power to the state, that the federal government would be a huge monster. Moreover, because this is an important point, George Washington did imagine that Washington DC was going to grow, but not as a center of government. He said, “Let us put the federal government in the place which is most logical in terms of the commercial and industrial future of the United States.” Because, he said, “This will bind the country north and south together.” That concerned him. R.J. Rushdoony: 32:17 “We have the tremendous iron deposits in Alabama.” What is now Alabama. He was aware of them. Almost no one else was. “We have the manufacturing skills of the north. This is a logical place for an industrial center,” and he wanted the capitol to be the industrial center of the country. Moreover, he said, “We have an ideal harbor here. Plus, we have the Cumberland gap and out of here the emigrants can go most easily to the west.” So geopolitically, Washington was the most astute man living in his day, and we owe a great deal of our advance to his vision and that of Patrick Henry. Unfortunately, Thomas Jefferson, having been at Versailles, patterned Washington DC after Versailles to be a center of architecture, and beauty, and of the arts and so on, and he smashed Washington’s plans. 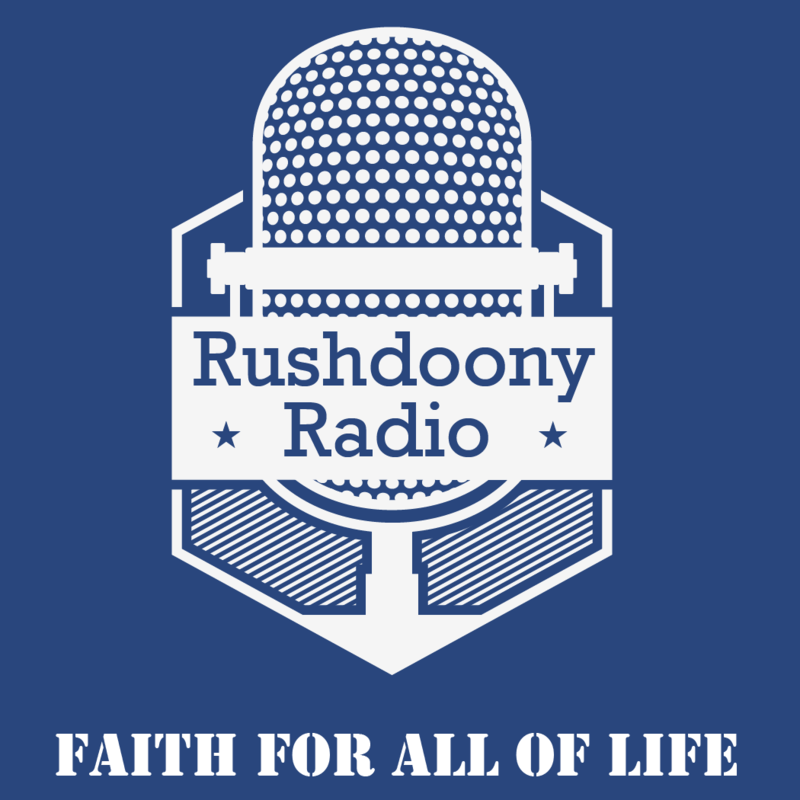 R.J. Rushdoony: 33:29 I think we have time for one more. Yes. Speaker 4: 33:31 I so agree with everything you said, but I’m wondering, [inaudible 00:33:37]? R.J. Rushdoony: 33:43 “Are you doing the most important thing and putting Pat Robertson in?” Well, that’s not a question where I should answer, but since that has never restrained me before, I won’t let it restrain me now. I’ve been on the 700 Club four times, and I believe that Pat Robertson is the best interviewer I’ve ever encountered. He knows how to get to the heart of a question and to give a man a chance to answer a question. But I think he’s doing a great job where he is and he ought to stay there. First, he has no political experience and it’s a jungle. It takes years and years to get political expertise, and know how to handle things, and it has to be not only on the state level, but the federal level. R.J. Rushdoony: 34:44 Second, to be successful in politics, you have to enjoy a fight. And if you’re thin-skinned, you’re a loser. The media and your opponents will be on you like a pack of wolves. Pat Robertson is a sensitive person. That’s not to his discredit. And as a sensitive person, he hurts when he’s unfairly criticized. Then third, Pat Robertson has made a terrible statement three or four times. He has been asked, “What will your stand to be as president with regard to the homosexuals and the abortionists?” And he has said, “As president, I will be a president of all the people rather than of the Christians only.” Well, why are we electing a Christian if he’s going to represent everybody except us? I think Pat Robertson can do a great deal of good for the future of the country where he is. I wish you’d go back there. R.J. Rushdoony: 36:07 Then, let me add one thing more. I’ll try to stop there. I believe the next president is going to be the most hated president in all American history because he’s going to reap the havoc that has been wrought by presidents from the time I was born in 1916 and earlier, a policy that has led us down the garden path. We have now, to say one thing alone, the huge overhang of debt, and every country in the world is on funny money in head over heels in debt, and the depression that occurred from ’29 on until Roosevelt solved it, so called, by creating a war economy, will be nothing compared to what’s coming. It’ll be the greatest disaster in all human history. I don’t like to see anyone I like get the blame for that. That’s why I was so glad when a very fine man who’s a friend of mine, Lew Lehrman, dropped out and left Washington, because Lew Lehrman is the smartest man we’ve ever seen in Washington in recent years, and he knew what the score was and it wasn’t anything he wanted any part of. R.J. Rushdoony: 37:35 Well, I think our time is up. Martin, do you want to take over if there are any announcements? Speaker 5: 37:40 [inaudible 00:37:40].